Founded as a family business, EcoSox is committed to providing quality socks to meet the needs of all consumers. Whether you’re looking for socks to wear for work, outdoor activity, sports, or your diabetic condition, EcoSox delivers you quality socks made with yarns typically sourced from renewable bamboo or other eco-friendly products like recycled cotton. BBS Hosiery, Inc. was founded in 1988. As a family owned and operated entity, BBS Hosiery took pride in providing wholesale customers a full range of private label programs. For over 25 years, BBS Hosiery specialized manufacturing and distributing to both small and large retailers. In 2008, product focus shifted from providing your typical run-of-the-mill product to manufacturing goods of quality and performance a step above our competitors. 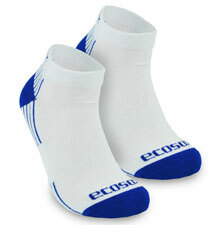 EcoSox was brought to life as a high-end sports socks manufactured from bamboo viscose. Bamboo viscose yarn is excellent at removing moisture which helps keeps your feet dry, clean, and blister free. The moisture is removed away from the skin where it evaporates. Evaporation helps keep your foot cool in the summer and warm in the winter. Our yarn does this naturally without chemical additives and conditioners which are often harmful to the evironment. EcoSox takes pride in the fact that bamboo is one of the most sustainable resources on the planet making EcoSox products high performance and eco-friendly. In 2017, BBS Hosiery was sold to JAG Companies, Inc. which assumed the EcoSox brand and family tradition. EcoSox is focused on improving its products, committed to reducing the environmental footprint of its products and operations, expanding into new categories, and increasing distribution.